If you’re unable to find information on your ancestor through a search engine or online database, or if you’re looking for additional information, another resource to try is a comprehensive genealogical index. 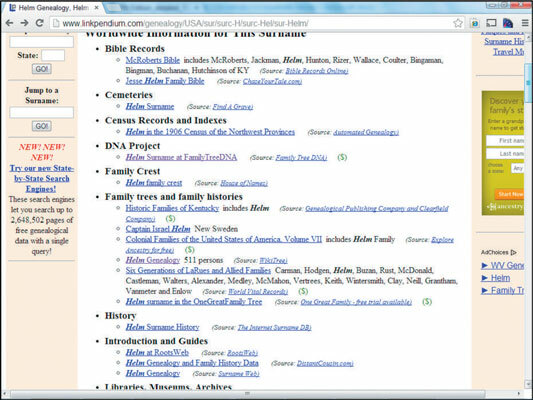 A comprehensive genealogical index is a site that contains a categorized listing of links to online resources for family history research. Comprehensive genealogical indexes can be organized in a variety of ways, including by subject, alphabetically, or by resource type. No matter how the links are organized, they usually appear hierarchically — you click your way down from category to subcategory until you find the link for which you’re looking. Fire up your browser and go to Linkpendium. This step launches the home page for Linkpendium. Scroll down to the portion of the main page with the links to surnames. Click a link with a letter for your surname. For example, you’re looking for Helm, so click the H surnames link. Click the link that contains the first three letters of the surname you’re researching. Click the link entitled Hel Families: Surname Genealogy, Family History, Family Tree, Family Crest. Click the link to your surname. Click the Helm Family: Surname Genealogy, Family History, Family Tree, Family Crest link. One drawback to comprehensive genealogical indexes is that they can be time-consuming to browse. It sometimes takes several clicks to get down to the area where you believe links that interest you may be located. And, after several clicks, you may find that no relevant links are in that area. This lack may be because the maintainer of the site has not yet indexed a relevant site or the site may be listed somewhere else in the index.